Hubbard and Grauer Have a New Book! Dr. James E. Hubbard, Jr. and Jared Grauer of the University of Maryland Morpheus Laboratory are contributing authors to the first comprehensive book on morphing aircraft. 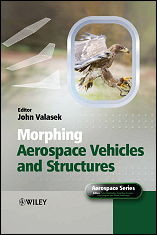 The book, titled Morphing Aerospace Vehicles and Structures, was edited by John Valasek. Morphing Aerospace Vehicles and Structures is a synthesis of the relevant disciplines and applications involved in the morphing of fixed wing flight vehicles. The contributors are all leading researchers in their field. The book is organized into major sections on Bio-Inspiration, Control & Dynamics, and Smart Materials & Structures. Most chapters are both tutorial and research oriented in nature, covering elementary concepts through advanced and in many cases novel methodologies. Insightful numerical and experimental results compliment the technical exposition wherever possible. To stimulate and encourage further investigation, all chapters discuss further topics for research in particular subject areas, and a summary chapter addresses broad challenges and directions for future research. The book is an introduction and a reference that will be useful to both practicing engineers and researchers in aerospace and mechanical engineering. While emphasizing detailed mathematical modelling and simulation, attention is also paid to practical approaches and an introductory history of morphing. For more information on purchasing this book you can visit the Wiley Publishers website.